The elbow is a joint that connects the humerus bone of the upper arm with the radius and ulna bones of the lower arm through a complex network of muscles, ligaments, and tendons. More than a simple hinge, the unique arrangement of these tissues also allows for rotation. Treatment of injuries and diseases requires specialized knowledge. 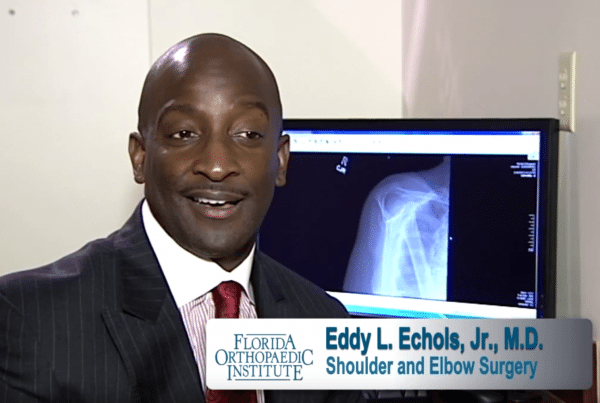 Our physicians are recognized as leaders in the diagnosis and treatment of elbow problems. They provide an extraordinary base of shared knowledge with leading-edge surgery and treatment. Overhand throwing places extremely high stress on the elbow and when repeated, it leads to serious overuse injuries, especially in throwing athletes like baseball pitchers. Common throwing injuries of the elbow include flexor tendinitis, ulnar collateral ligament (UCL) injury, valgus extension overload (VEO), olecranon stress fractures and ulnar neuritis. 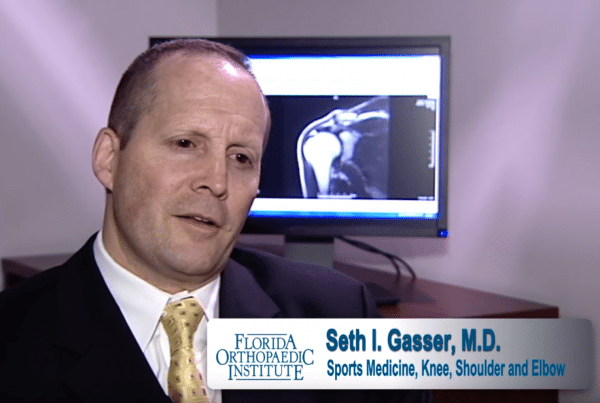 To learn more about throwing injuries of the elbow, nonsurgical treatments and Tommy John elbow surgery for UCL injuries, click on the link below. Golfer’s elbow (medial epicondylitis) is a condition that produces pain where the tendons of your forearm attach to the bump on the inside of your elbow. The pain sometimes spreads into your forearm and wrist. Golfer’s elbow is similar to tennis elbow, which occurs on the outside of the elbow. Golfer’s elbow is not limited to golfers. Tennis players and others who repeatedly use their wrists or clench their fingers also can develop golfer’s elbow. The majority of patients that have golfer’s elbow don’t play golf or tennis. Most of the time, it is an overuse injury. Typing on the computer or repetitive activities at work can overwork the tendons and create small tears, causing the pain. Golfer’s elbow symptoms occur on the inside of the elbow and can happen slowly or quickly. The elbow may feel stiff and hurt when making a fist. Some people feel weakness and tingling in the arm and fingers. Pain may get worse when swinging a racket or golf club, shaking hands, squeezing a ball, turning a doorknob, lifting weights, or flexing the wrist. 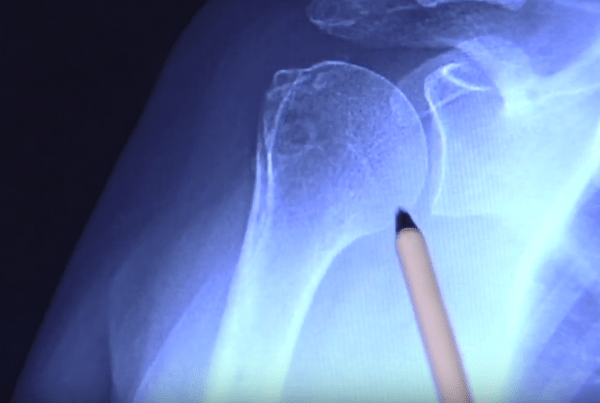 A break in the bony “tip” of the elbow is called an olecranon fracture. The olecranon is the pointy segment of bone and part of the ulna. It is one of the three bones that come together to form the elbow joint. Since the olecranon is positioned directly under the skin of the elbow, it does not have much protection from either muscles or other soft tissues. If you experience a direct blow to the elbow or fall on an outstretched arm, it can break easily. An olecranon fracture can be very painful and make elbow motion difficult or impossible. Olecranon stress fractures can occur from extreme abuse and overuse like athletes who throw frequently. Tennis elbow (lateral epicondylitis) is caused by inflammation of the tendons that attach the muscle in the forearm (extensor carpi radialis brevis) to the outer bony bumps at the bottom of the long bone of the arm (humerus) called the lateral epicondyle. Not limited to tennis players, tennis elbow can occur in anyone who strains the tendons of the forearm. In tennis, maneuvers like a one-handed backhand with poor form or technique, a late forehand swing resulting in bending the wrist significantly or turning and snapping the wrist while serving with full power can lead to tennis elbow. Tennis elbow can also occur from repetitive movements of the wrist. These motions can include tennis, hedge clipping, excessive use of a hammer or screwdriver, painting, or any activity that requires constant gripping or squeezing. Some tennis elbow symptoms and signs include tenderness on the outside of the elbow, soreness of the forearm muscles, elbow pain when grasping or holding an object, and morning stiffness of the elbow with persistent aching. Ulnar collateral ligament injury of the elbow is when the ligament on the inner side of the elbow is sprained or torn. The ulnar collateral ligament (UCL) keeps the upper arm bone (humerus) and the one of the forearm bones (ulna) in place. Ulnar collateral ligament (UCL) injuries can occur from repetitive stress to the inside of the elbow. Because of the popularity of overhead sports such as volleyball and baseball, UCL injuries are becoming more common. Often referred to as a “Tommy John” injury, after the famous baseball pitcher who underwent the first surgery for a UCL injury in 1974. Valgus extension overload is a common injury among throwing athletes and is also known as ‘Pitcher’s Elbow’. Repetitive throwing, such as in baseball pitching, causes massive stress to the elbow. When the olecranon and humerus bones are twisted during throwing, it forces them together. This can cause the protective cartilage on the olecranon to be gradually worn away. Throwers with Valgus Extension Overload typically have pain at the tip of the elbow in the deceleration and follow-through phases of throwing. There may be a sharp pain or a snapping sensation as they release the ball. Pain typically increases over time and only happens during throwing and not in other daily activities. Other symptoms can accompany the pain including numbness, tingling and loss of velocity or control. Performed under local anesthesia with sedation or general anesthesia, this outpatient procedure allows the surgeon to examine the cartilage, bones, ligaments and tendons of the elbow for damage or disorders. A small camera, called an arthroscope, is inserted into the elbow through a very small incision. The camera gives the surgeon with a close-up view of the entire procedure on a monitor. The olecranon bursa is located at the back of the elbow (the olecranon) between the skin and the bone. It is a small, thin fluid-filled sac that provides cushioning to the bones, tendons and ligaments of the joint. If the bursa becomes irritated or inflamed, fluid begins to accumulate within it, leading to the development of olecranon bursitis. Aspiration of the olecranon bursa relieves pain and swelling in the elbow caused by bursitis, or inflammation of the bursa. This nonsurgical procedure removes the fluid from the bursa with a needle. An aspiration can provide relief of symptoms and helps the doctor to determine exactly what is causing pain around the elbow. 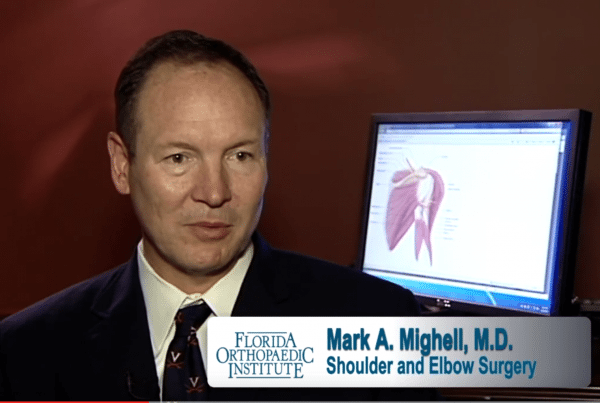 Florida Orthopaedic Institute’s fellowship-trained Shoulder & Elbow Specialists talk about shoulder and elbow injuries and the advancing technology available to treat them, thanks, in part, to ongoing research by Florida Orthopaedic Institute’s own surgeons.